Tyson Gay is one of the best runners in the world. He is the second fastest runner in 2011 after Usain Bolt. Tyson Gay was a American sprinter who mainly concentrates on 100m and 200m events. Tyson Gay was born in the year 1982 August 9 at Lexington, Kentucky, U.S. He is currently residing in Clermont, Florida, U.S. At the age of 22, Gay made his national debut in NCAA Men's Indoor Track and Field Championship and finished 4th in 60m event and 5th in 200m event. In 2004, Gay reached semifinals of US Olympic trials in 100m and 200m events. In 2005 World Championships Athletics, Gay finished 4th in 200m. In 2005 World Athletics Final, Gay won a Gold medal in 200m event which was his first major professional medal. Tyson Gay was the World Athletics Final champion in 2006 IAAF World Athletics and became the third fastest runner in 200m. As Gay suffered injuries in 2008 Beijing Olympics, he failed to qualify for 4x100m relay finals and 100m semifinals. Gay holds the record of second fastest runner in the world after Usain Bolt and he also holds the record for US with 9.69 s in 100m. More details about the profile and career records of Tyson Gay are given below. 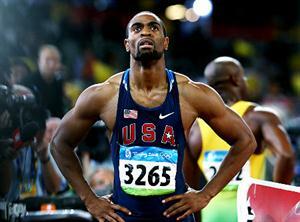 Tyson Gay birth place: Lexington, Kentucky, U.S.
Current residence: Clermont, Florida, U.S.